Archery a Sport for All! We provide top quality instruction, with excellent equipment, creating an enjoyable and safe environment at a competitive price to make your Archery Xperience an unforgettable one! TRUE - Archery is easy to learn but difficult to master. With an experienced instructor and the right equipment archery is easy to learn and achieve success in as little as 1 hour. TRUE - Archery is fun for all ages and abilities. We see many examples of people who have been inactive for many years or labelled 'non-sporty' that try archery and achieve instant success and take up the sport! TRUE - One of the few family sports and one that you can do for life! 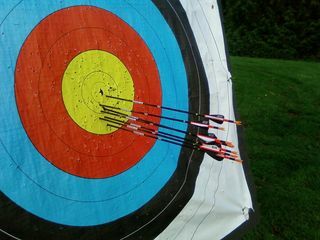 TRUE - Archery is one of the safest sports and is growing in popularity faster than most sports! FALSE - I am no good I cannot hit the target. This could not be further from the truth, with the right instruction EVERYONE can achieve success! FALSE - Archery is just about shooting arrows. This is just not the case, an event can be tailored to suit your requirements, individual, team, types of targets, types of bows, different themes etc. Use Xperience Archery for your ultimate archery Xperience! Next Beginners Courses due to start in January 2019! Places still available. Dates for all 2019 Beginners now available. Courses running in January, April, June and September! We can also run private beginners courses at times to suit you!